There are so many places lost beneath the waves around the world, you could create an alternate atlas of watery wreckages. But during the 20th century, the number of towns underwater increased exponentially as hydroelectricity projects submerged some to create power for many. These drowned towns were intentionally flooded behind new dams, their buildings removed or dismantled, and their residents displaced. In recent years, droughts have allowed some of these towns to re-emerge. Others remain underwater. Here are 10 haunting waterworlds. It’s now a haunting stretch of pale rubble and skeletal trees, but in the middle of the 20th century Villa Epecuén was one of Argentina’s most popular tourist spots. The once-charming village was developed in the 1920s to take advantage of the therapeutic salt waters of Lago Epecuén, some 340 miles southwest of Buenos Aires, and the population peaked in the 1970s at some 5,000 people. But in 1985, tragedy struck: heavy rains broke a nearby earthen dam, inundating the town and its hundreds of businesses. Beneath the waters of Lake Qiando in China's Zhejiang province lies the 600-year-old "Lion City" of Shi Cheng. Flooded in 1959 to create a reservoir and hydroelectric station for the nearby city of Hangzhou, its beautiful ruins have been surprisingly well-preserved by the water, which reportedly protects the buildings better than if they were exposed to sun, wind, and rain. The ruins were relatively unknown until a Chinese government expedition in 2001, which found a small city of wide streets, five entrance gates, and 265 archways featuring ornate stonework carvings of lions, dragons, and phoenixes, as well as historical inscriptions dating back to 1777. But although Shi Cheng gets most of the attention, it's just one of the towns flooded to create Hangzhou’s reservoir: the even more ancient He Cheng was established in 208, and also disappeared beneath the waves in 1959. Local diving companies regularly offer tours of the Shi Cheng ruins, although since they’re not well-mapped, they dives are recommended for advanced divers only. Now’s a good time to visit the flooded jewels beneath Lake Qiando, which could see more traffic after a proposed tunnel through the lake is completed. 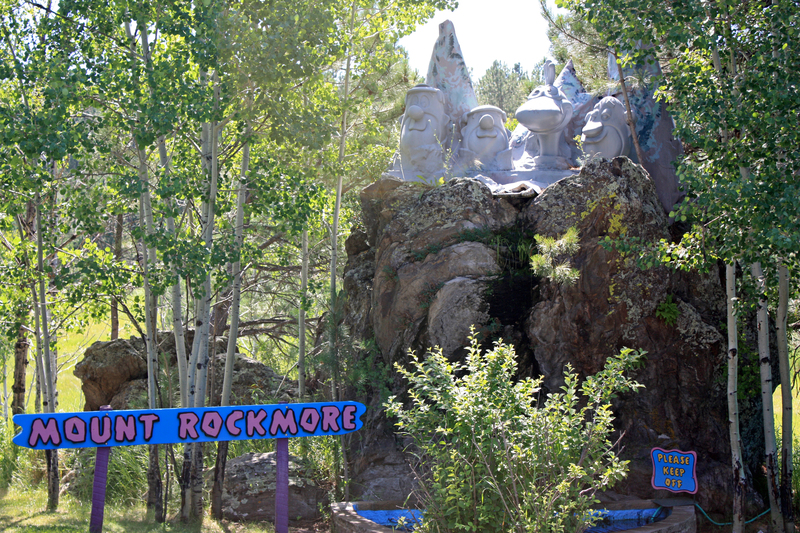 There are rumors of other proposed developments aimed at helping tourists see the ruins. The $6.4 million submarine built for exploring the lake was completed in 2004 but has never been used, thanks to opposition from local officials. It's like something out of a short story: a tiny but vibrant village, known for its remarkably democratic way of life, is flooded by the local power company to create hydroelectricity for the region. As they prepare for the end, villagers gather up stories, artifacts, and memories to create a museum memorializing their old town and its communal way of life. 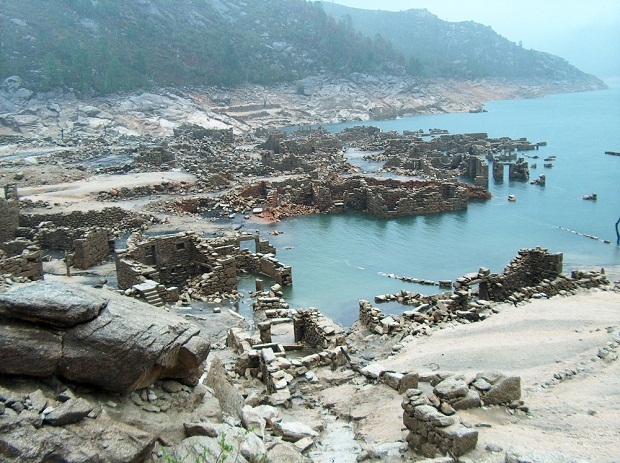 That's what happened at the 2000-year-old town of Vilarinho da Furna in Portugal’s Minho region. According to oral accounts, the village is said to have been founded by Romans in the 1st century CE, and flourished for two millennia before being flooded by the Portuguese Electricity Company in 1972. In 1981, a museum dedicated to the submerged town opened in São João do Campo; the building was constructed using stones from some of the village’s old houses, and displays artifacts from the town. But that’s not all: remnants from the town can be seen during dry periods in the spring and fall, when water levels in the reservoir recede, and the remnants of walls, windows, and doors of the town re-emerge. Located 50 miles northeast of Las Vegas, St. Thomas was established in 1865 as a Mormon outpost before becoming an agricultural community briefly known for producing cantaloupes and asparagus. In the 1930s, after the creation of the Hoover Dam, Lake Mead flooded, washing over the entire town. Today, during times of drought, the foundations of St. Thomas reappear—although each time they re-emerge, more of the structures have disappeared. In 2005, parts of 40 buildings were visible, including remnants of an old school and ice cream parlor. According to the National Park Service, much of the town is visible right now due to the current drought. In what remains of Potosi, Venezuela, the mildewed ruins of a gothic church sit alone in a giant field. At one point, the church was part of a vibrant Andean village with 1200 inhabitants, but in 1985 the town was flooded when a nearby river was dammed to create a hydroelectric plant. 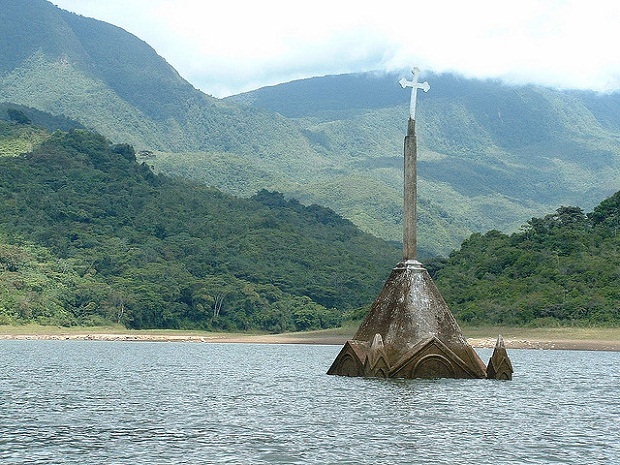 For about 20 years, only the cross of the church's steeple was visible above the waters, as if marking the grave of the entire city. In 2008 the waters of the reservoir began to recede due to a severe drought linked to El Nino. By 2010 the church had been completely uncovered, joining the ruins of local houses, the town square, and a cemetery, all of which can now be seen. They used to call it the "Wickedest City on Earth." For decades in the 17th century, Port Royal was known for its rum, prostitutes, and pirates, who used the town's strategic location in the middle of the Caribbean as their base for plundering Spanish treasure fleets. But in 1692 the city was hit with a massive earthquake, which destroyed some buildings and sucked others into the sand. 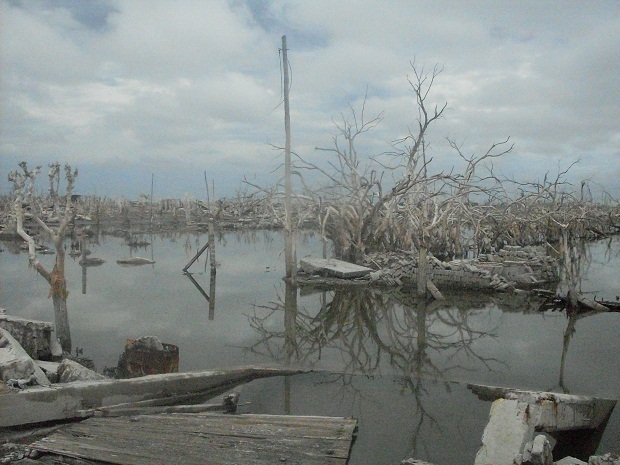 The tsunami that followed drenched the town, swallowing up 33 acres for good. In all, at least 2000 people were killed. Today, much of the once-scandalous city lies 40 feet below water. Since the 1950s, divers have been exploring the ruins, which are said to be remarkably complete. As Atlas Obscura notes, access from the government is required to dive. For those who don’t want to get wet, many of the artifacts recovered over the years can be seen at the Museums of History and Ethnography at the Institute of Jamaica in Kingston. New York may have the highest concentration of drowned towns in the U.S., thanks to the number that were submerged to supply thirsty New York City. Between 1910 and 1928, dozens of farm villages in the Catskills were flooded to create reservoirs for the Big Apple. The creation of the Ashokan Reservoir, which began operating in 1915, required the abandonment and flooding of about a dozen hamlets alone. On the cusp of being displaced, thousands of residents were asked to help clear out their homes and businesses, and in some cases even dig up their relatives and move their bodies. Today, some claim that when water levels are low, the tops of the churches, schools, barns, and orchards drowned by the creation of Ashokan can still be seen. During a major drought in 2002, building foundations and old wells were revealed. Direct access to the reservoir has been limited since 9/11, but you can still catch a glimpse of the structures from nearby bridges. The Catskills are also home to perhaps the most ironically named drowned town of them all: Neversink. The town was one of two flooded in 1953 for the creation of the Neversink reservoir. The other town displaced to create the new water supply was named Bittersweet. In 2012, a severe drought in the Midwest revealed the remnants of Monument City, including the foundations of houses and bricks from the old schoolhouse, long since demolished. The tiny town (estimated population: 30), established in 1875, was one of three flooded to create the Salamonie reservoir in 1965. 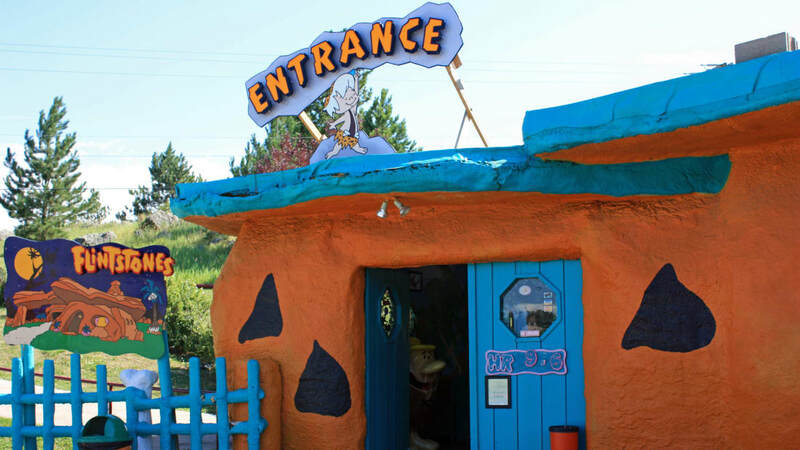 After water levels fell by 12 feet in 2012, locals began flocking to the area to take remnants of the tiny town, before the Department of Natural Resources finally stepped in to offer supervised tours. The reservoir was originally created to help prevent the flooding of other towns. When water levels in the reservoir are low, the remnants of the town can again be seen. In 1939, Joseph Stalin gave orders to flood the 12th-century town of Kalyazin, Russia to build the Uglich reservoir. 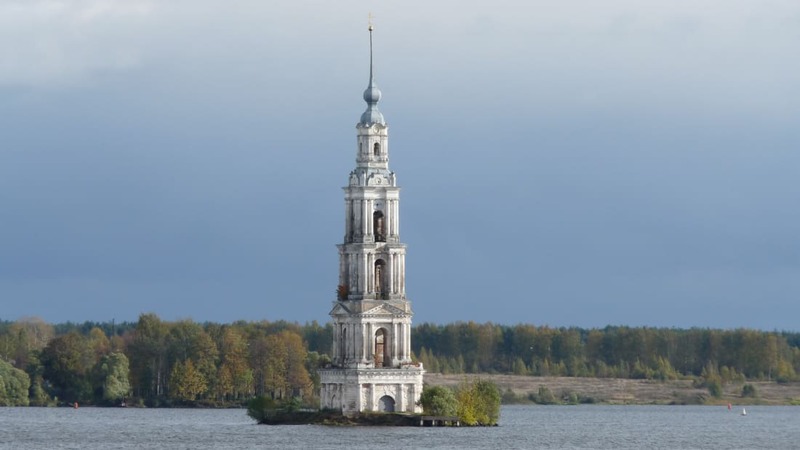 The waters submerged several medieval buildings, including two monasteries, but the Kalyazin Bell Tower, also known as the "Flooded Belfry," is still looming above the Volga. At 244 feet high, the 19th-century campanile is one of the tallest Orthodox Christian structures in the world. 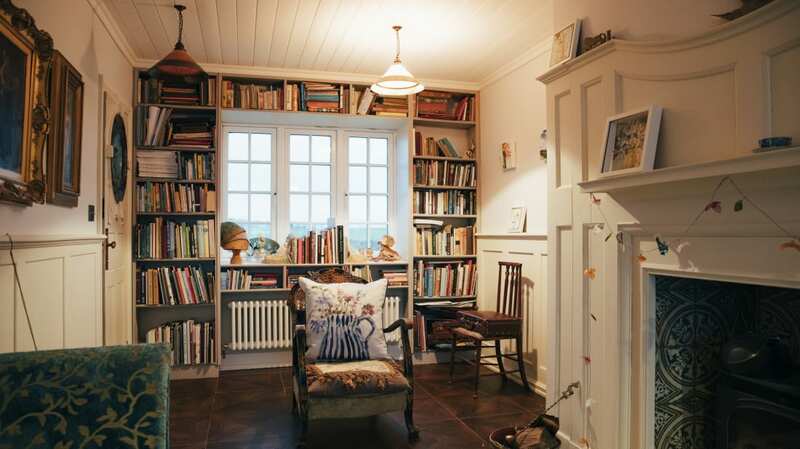 (It looks a bit like a many-layered wedding cake.) Authorities have reinforced the tower and built a small artificial island around it, turning it into a popular spot for swimmers and tourists. Amazingly, Orthodox Christian services are still held inside the tower several time a year. 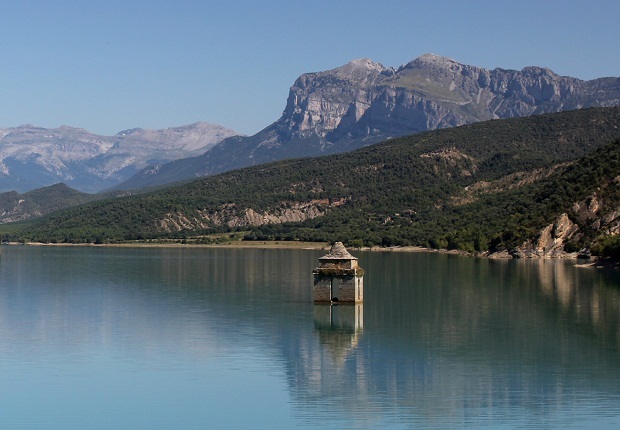 Spain has a number of drowned towns, but one of the most notable sights is the Church of Mediano (above) in La Fueva, Huesca. The church, which dates to the late 16th century, was submerged in 1974 to create the Mediano Reservoir. The tip of the steeple is always visible, even when the reservoir's levels are full. Intrepid divers used to be able to explore both the inside and out, but the inside has been boarded up for safety reasons. 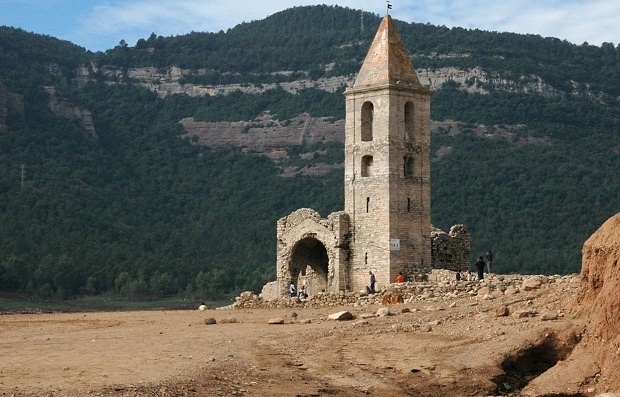 Elsewhere in the country, in Catalonia, the ruins of the 1000-year-old village of Sant Romà de Sau (below) are also visible when water levels in a nearby reservoir drop, and include their own atmospheric church.